Together with the Finish Jeweller Krista Ruohonen and Australian jeweller Anita van Doorn, we created a piece for the project Schmuck Wander. This project was conceived using the method of collaborative creation, by means of improvisations with no specific goals being set in advance. In one piece from two to five authors meet in creative dialogue as a part of our communication through object and jewellery medium. 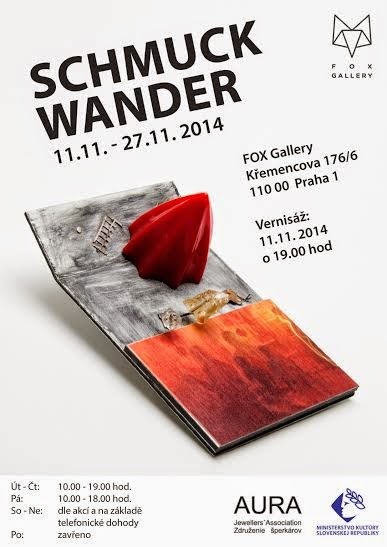 The exhibition was last november, 2014 at Fox Gallery, Praga. For more information, please visit www.carolinagimeno.com You will find a direct link on the header of this blog. Thanks for your visit! Featured at DMAG, Art & Culture Magazine, Torino-Milan. DMAG is a magazine from Torino- Milán Italy about Art & Culture. Carolina Gimeno’s work has been feature in the nº14 March/April , page 22 in the section about trends curated by Caterina Marini. Arritmia, Bórax08001 at Amaranto Gallery, Barcelona. Art Palm Beach Florida, Represented by Gallery Charon Kransen Arts NY. ÈCLAT – Masters of New Jewellery Design, Editorial Promopress. Delirio y Cordura Jewellery Exhibition at Gallery Velvet da Vinci, San Francisco, CA. USA. Unravel & Sophisticate. Lamar Dodd School of Art. University of Georgia. Master Degree of Fine Arts in Jewellery and Corpus, Ädellab. Konstfack. Think Twice, New Latin American Jewelry. Think Twice: New Latin American Jewelry at Centro de las Artes de Monterrey México. Die Renaissance des Emaillierens, Galerie Handwerk. Munich, Germany. Mundos Paralelos / Parallel Worlds Amaranto Joies. Barcelona, Spain. The next 4th of October Aaron Faber Gallery will be present the works of a group of artist invited to show theirs works in the exhibition called IN LINE/ IN METAL. This exhibition will also be presented at SOFA Chicago 2011. THINK TWICE: New Latin American Jewelry, Bellevue Arts Museum. Washintong, USA. Talente 2011, International Applied Arts and Technology Competition, Munich, Germany. Annual of Marzee Selection of Graduate Work Jewellery 2010. Nijmegen, The Netherland.